Without Congressional action, federal funding for the Children’s Health Insurance Program (CHIP) is due to end in September 2017. The National Academy for State Health Policy (NASHP) created this infographic to highlight the main policy and operational issues that would need to be considered and addressed in states with separate CHIP programs if future federal funding for CHIP remains uncertain in the coming months. Supported by the David and Lucile Packard Foundation. 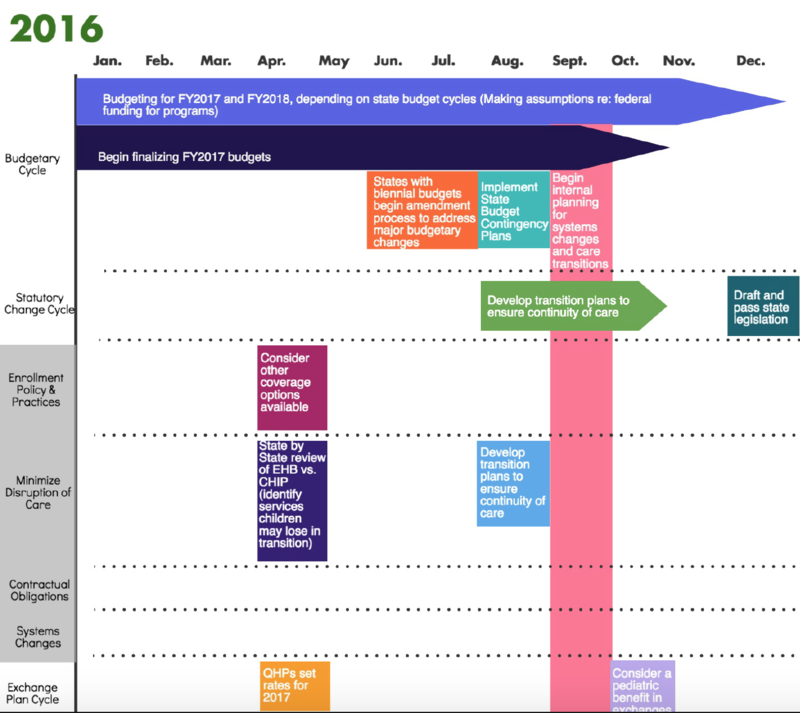 A Timeline for state health policy and operational considerations if CHIP funding ends. * This timeline was developed based on guidance and input from state CHIP officials, and outlines key budgetary, statutory, and programmatic issues and changes that states would need to consider and/or implement. This timeline assumes that states will have funds available to spend from their federal CHIP allotment through at least the first quarter of federal fiscal year 2018. States have different budget cycles and while this timeline notes critical decision points for states, the time in which changes will need to be made, especially those with biennial budgets, may differ. Also, states will need to work closely with CMS to make many of the policy changes needed if the future of federal funding remains uncertain, so the timing of federal guidance will affect states’ ability to make some critical changes.